About 30 students showed up to Saturday’s borough warden training course for women in Taoyuan. Huang Li-yu (黃麗伃) has wanted to be a borough warden (里長) since junior high school. Fresh out of graduate school, she’s finally running for office in November — but the odds are stacked against her. Not only is the average age of Taiwan’s borough wardens 61.5 years, only 14 percent of them are women. National Alliance of Taiwan Women’s Associations (台灣婦女團體全國聯合會, NATWA) chairwoman Chen Hsiu-hui (陳秀惠) says that while that figure has improved over the past few decades, it still pales in comparison to legislators, of which 38.5 percent are female, special municipality city councilors at 35.5 percent and regular city and county heads at 27.3 percent. 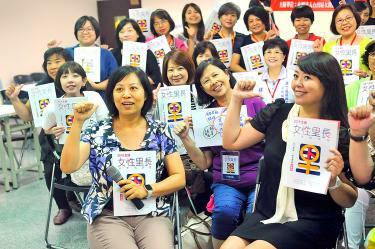 “[Taiwan’s] educated women seem to be gaining influence and power in the central government and on the city and county levels, but on a more basic community level, they haven’t yet to smash the ‘do the work and keep your mouth shut’ stereotype,” Chen says, noting that community volunteers are nearly 70 percent female. Chen is hopeful for change, as NATWA’s five female borough warden training sessions held since early July were booked to maximum capacity, with 50 participants at each session. About one-third of these women plan to run in November’s elections, others plan to run in four years, a few are canvassing for other politicians and the rest are mostly dedicated community volunteers who simply came to learn more. Chang Chin-fang (張錦芳), a single mother and active community volunteer with a full-time job and no political experience, says she’s surprised by the statistics. The life of a borough warden is hectic, as they are the ones on the front lines solving problems in the community. Wardens have to balance everyone’s needs as well as actively find ways to improve residents’ lives, from sanitation to solving landlord-tenant disputes to taking care of the disadvantaged or elderly. And when women traditionally have to look after the home, many simply do not have the energy to run for office. Saturday’s participants were given a taste of a warden’s duties. Current borough wardens of both genders and activists shared their experiences in a variety of topics, including stray animals, leftover food and sustainable development. As current warden for Taipei’s Zhangwen Borough (樟文), Lin Shu-chu (林淑珠) has a pulse on the entire community. “Everyone’s business is my business,” Lin says. Chou Hsueh-ju (周雪茹) says that many, like her, wait until their children have left home before considering running. Each borough differs in terms of how conservative its constituents are. Huang says she had a good role model in her community’s longtime female borough warden, who stepped down four years ago. As a child, she would marvel at how the warden could solve her family’s problems, citing as an example stopping people from parking bicycles in front of their home. But Lee Mei-hsuan (李美璇) says that her community has more older people who are less inclined to listen to a woman, saying that compared to a city councilor who may focus on policy, borough wardens are much closer to their constituents and must rely on their cooperation. There is also the issue of socializing. Borough wardens need to have good relations with the local and neighboring elites and people with power, and much of it involves “drinking and attending banquets” (喝酒應酬) or other functions, which November hopeful Chou Kai-yin (周凱茵) says is harder for women to participate in. “There are lots of local politics in play, and if you can’t go in and rub elbows with people at these functions, you’ll miss a lot of opportunities,” Chou says. Lin expresses delight that NATWA is holding these classes because there are few resources for women running for office. She says that although she was able to rely on her 30 years of experience in the community to get elected, many women don’t know where to start. For the most part, once elected, most of the participants in the seminar say that they don’t foresee many gender-specific difficulties — besides drinking and socializing. While Huang has the backing of her well-respected family, which has been serving the community for generations, she still has to do tireless campaigning to prove herself as a young woman. But she says she is running because the man who replaced the previous female warden has little connection to the community. Chou, on the other hand, is trying to build her own guanxi (關係), or social networks, without trying too hard to penetrate the traditional social circles of her community, especially because it’s the same few people who have been elected along party lines in recent years. Instead of drinking and cozying up with police, temple owners, other politicians and prominent residents, which has traditionally played a big part in a borough warden’s job, she plans to let her actions do the talking. She also collaborates with city council members who share her community goals, forming alliances outside the confines of traditional socializing. The good news is that, while the numbers of female borough wardens are low, the actual election rate of males and female borough wardens are about the same. Chen says that society needs female leaders at the local level because, while the central government makes policy to promote gender equality, it’s these wardens who work most closely with local communities. Copyright © 2016 台灣婦女團體全國聯合會　All rights reserved.